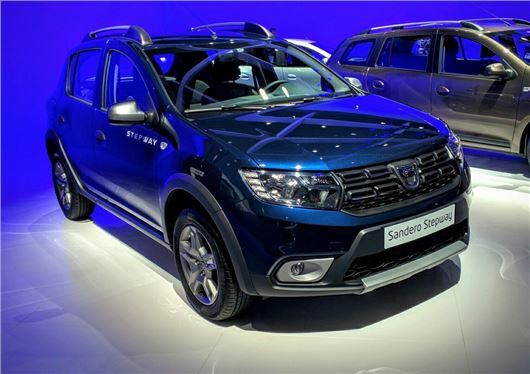 Dacia has launched the 2017 Sandero and Logan at the Paris Motor Show 2016. Both models keep their bargain basement prices, but get a range of mid-life updates, with LED daytime running lights, restyled bumpers and the option of a new three-cylinder petrol engine. The revised models should reach the UK before the end of 2016. Priced from a respective £5995 and £6995, the Dacia Sandero and Logan get a more modern front bumper design, along with chrome detailing for the air intake grille. The front LED daytime running lights feature a pattern of three stacked rectangles, while the rear light signature is based on three illuminated squares. Both the Sandero and Logan get the option of a new 75PS 1.0-litre petrol engine. Dacia claims that this new three-cylinder engine will be its most efficient; however, it hasn't released any fuel or CO2 figures for either model. Dacia has also increased the options list, with a rear view camera and hill start assist now available for both the Sandero and Logan. The electric window switches have also been relocated to the door panels and the driver can specify a retractable armrest incorporated into the driver’s seat.